Alas, it has been a long time since I’ve update this blog! Work and a host of other time-occupiers pulled me away for a while, but now it’s mid-summer and I’m back! The trees are fully leafed out, the chickadee are losing the fight with the squirrels for the birdfeeder, and the foxes in the neighbors’ wood lot bark back and forth to each other in the middle of the night for reasons known only to themselves. What’s tiny, shiny and destroys fully-grown ash trees as well as any fire-breathing dragon? Yes, it’s the emerald ash borer, that infamous pest from Asia, whose larval feeding tunnels can girdle the inner bark of an ash tree, cutting off its supply of nutrients and water and eventually starving the tree to death. 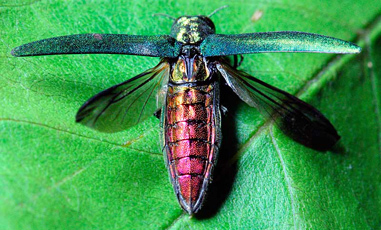 The adult emerald ash borer (EAB), as its name suggests, is a bright, iridescent green beetle, about ⅓ inch long. It has a coppery-red upper abdomen that is often hidden under its wings. Happy Fourth of July weekend to you all!